This is a virgin 28-team NES TSB ROM with one big change - all DEFENSIVE PLAYS have been changed to the respective "BLITZ" for every play. So, when you play it, no matter what, the defense comes at you like they picked your play. In addition, the OFFENSIVE PLAYS were changed to use the actual play that it would run when the defense picks the offenses play, like Pass 1 Pro T Screen for instance. I went in and copied/pasted the "blitz" play for every play, so that every pick is a successful play-pick. At the bottom of this post is a screenshot of the defensive bytes that were changed to the common blitz byte for every play variation. In this picture, you can see that the RUNS use a Blitz Byte of 5B, 53, 57, 5F, 8F, or 99. Pass play Blitz Bytes are 5F, BB, DA, and 22...that's right, there are ONLY 4 variations to a Pass-Play blitz! Also, in this picture, The top-left starts with the 8 variations of Run Slot 1, Play 1. It continues (left to right, top to bottom), 8 plays for each slot, 8 variations of each play, down to the very last Pass Slot 4, Play 8. Now, changing the defense is NOT ENOUGH - because the offense has 8 possible variations for any given play - so I had to go in and change all of the offensive plays to run the variation that it uses when the defense picks the offenses respective play (sorry, no picture for this). This ROM is made for the sole purpose of practicing responses to getting your play called! (Note - this is mostly useful for practicing getting your Pass Play called. Work on those timed taps! Tecmo Super Bowl AllBlitzes.nes Have fun. Hey all! 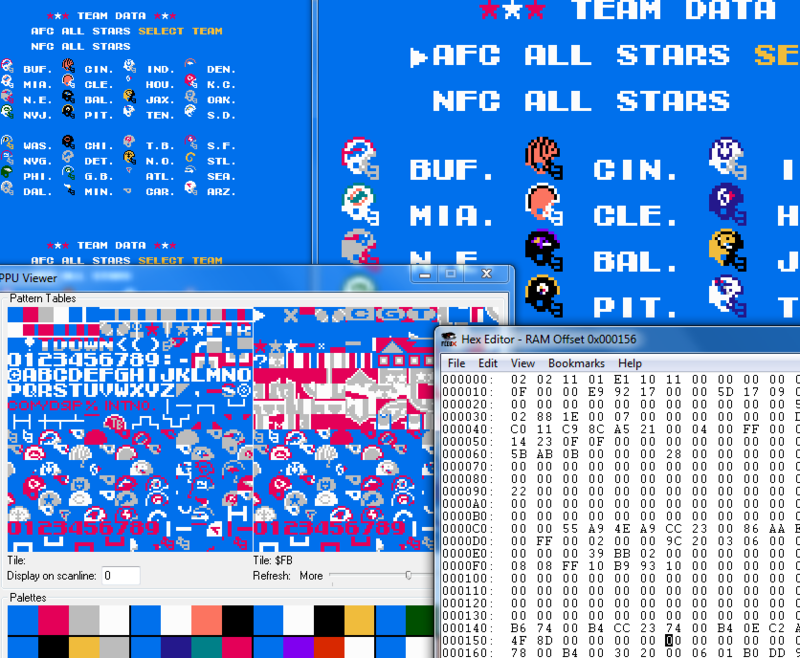 A few months back I was able to complete my 4th Season of Tecmo Fantasy Owners (TFO). For those who may not know what TFO it is basically a hacked TSB league where "football owners" create their teams at the beginning of the season through an RPG like form (salary capped), and then during the season the CPU controls all the action. I post all the games through our YouTube Channel (https://www.youtube.com/user/TFOFootball/playlists) over the 17 Week Season and 6 Week Post-Season. If you want more information on TFO check us our at our website (http://tfofootball.weebly.com/). ANYWAY: so I am returning for SEASON FIVE on February 2017. I have some ideas and plans but wanted to see if any of you TecmoBowl.Org peeps have some ideas or hacks that would work in this format. Currently the 2016 ROM is online here at TecmoBowl.Org. The file is attached below. It has the following hacks added to the game: --KR Glitch Fixed (now returns at player's speed) --PR Glitch Fixed (now returns at player's speed) --Pass Accuracy Glitch Fixed (Stat now works) --COM QB Intelligence (COM will attempt to throw to an 'open' receiver when passing) --Pass Defense Increased (Coverage increased on all pass plays - makes DEF select Pass Def on all Pass Plays) --End of 2nd/4th Field Goal (set to "> 25 seconds") --Punt Team Speed Reduction (Punt Team gets 1/2 speed boost from original TSB) --Run Playbook Swapped (Some plays in the Run Playbook are in different slots. Allows for 3 QB Sneaks, or 4 RB2 Runs) So Im asking for your help and advice. What hacks or ideas should I add to make the game to make it "fairer" for the human players. Remember this is an all CPU League so the Owners are forced to watch and cannot control their players other than when they submit their roster. Let me know what you guys think. I know some of my owners are "learning the system" and without making changes each year its easy for someone to continually dominate. I want to make it a fair and fun experience for all my players. Let me know and SEE YOU NEXT TECMO!!!! Hey everyone, I am looking for a developer or someone that can help me. I have many of the hacks and upgrades, but I am looking to do a game with 5 on 5 where the center can receive passes on a 50 yard field. I have one download with a 7 on 7 on a 50 yard field, but have no idea how to get to the settings I am looking for. It is for a flag football league I run. We also are looking to see if there are any developers out there that could program something similar to this game and use it on XBOX live Indie games. Coming next week... A little thing I've been working with... Stay tuned!!! Field Placement, Pre-snap Movement, & Post-snap Instructions by Xplozv (based on Jstout's great guide "NES Play Design Info") Jstout's guide can be found here: http://tecmobowl.org...ay-design-info/ Formats: No Pre-snap movement --- Placement, Y coordinate, X coordinate, Stance With Pre-snap movement --- Placement, Y coordinate, X coordinate, Shift, Time, Move, Y coordinate, X coordinate, Stance (only one exception that we will get to later) Placement D0 Command (Absolute) This command can place you anywhere on the field. You only use it once per player and only to start the instructions. There is only one CON with this command. If you are not careful your player will line up out of bounds depending upon which hashmark the ball is placed on. This is where the D1 command comes in. D1 Command (Relative) This command is only used in the original for WRs & CBs. That is because they line up close to the sideline all the time. The D1 command keeps them in bounds regardless of where the ball is placed. It is relative to the middle of the field instead of the ball like D0 is. If you use D1 for more than CBs, most of your defense will not line up with the offense if the offense is on the opposite hash, making your new creation useless. *** Next, we will talk about coordinates. Remember 1yd is x08(hex), 1/2yd is x04(hex), 1/4yd is x02(hex) and so forth. *** Y Coordinates Imagine a vertical line from sideline to sideline. The ball is considered the center, or midpoint, of that line. The ball's "Y" is always "F0", which is where the Center & QB is always going to line up. If you're planning to match up your DL to the OL, Here are the Y coordinates of the OL on the original TSB1(nes, snes, & genesis) : LT= "D8" LG="E4" C="F0" RG="FC" RT="08" They line up exactly 1 1/2yds away from each other. Here's how we know that: Add in hex: D8 + 08 = E0 + 04 = E4; Add in hex: E4 + 08 = EC + 04 = F0; Add in hex: F0 + 08 = F8 + 04 = FC; Add in hex: FC + 08 = 04 + 04 = 08; *** D0 & D1 differ in Y coordinates!!!!!! **** D0 command is as follows: Top of the screen sideline is about "B8", Bottom of the screen sideline is about "38", with the ball always being the middle at "F0". Remember what I mention about the D0 command earlier. When the ball is on top hash, B8 will line your player up out of bounds, and when the ball is on the bottom hash, 38 will line up your player out of bounds. I usually go no further up than about "C0 to C8" which will put your player covering the slot area just inside the CB at the top. To give you an even better idea of how high that is on the field, the FS has a default Y coordinate of C8. D1 command is as follows: Top of screen sideline is about "40", Bottom of screen sideline is about "C8". The only Y coordinate for the D1 command that you really need to use are "36" which is for the CB at the top of the screen(RCB) and "C0" which is for the CB at the bottom of the screen(LCB) these are their default values. X Coordinates *** You have to really pay attention to these when we get to movements & shiftts(pre-snap & post-snap). *** Imagine a horizontal line from endzone to endzone. The ball is the center of this line, however, the ball is now "00" instead of "F0". "00" is the neutral zone for all players not to cross. By default all players are lined up 1yd off of the ball (08), with the center being the only exception, he's 3/4yd off of the ball (06). By default, the farthest players are the safeties at 10yds (50). X coordinates use what I like to call "Scale 1" and "Scale 2" measurements. Here are the scales in 1yd increments away from the ball (15yds in length). 1 2 3	4 5 6	7 8 9	10 11 12 13 14 15 Scale 1: 08 10 18 20 28 30 38 40 48 50 58 60 68 70 78 1 2 3 4 5 6 7 8 9 10 11	12 13 14 15 Scale 2: F8 F0 E8 E0 D8 D0 C8 C0 B8 B0 A8 A0 98 90 88 *** Scale 1 only affects the placements commands D0, D1, and the move command D7 *** *** Scale 2 affects the move commands D7, D8, & D9 *** Stance The stance is always the ending of field placement. Either you're down, which is "EA" or you're standing, which is "EC". Simple as that. How to Apply? Practice!!! Let's have fun with a couple of default instructions and see what we can come up with. Reading Field Placement Instructions Default for FS is "D0 C8 50 EC". This means place(D0) 5yds above ball(C8) 10yds off the ball(50) standing(EC) Default for LC is "D1 C0 28 EC". This means place(D1) at bottom sideline(C0) 5yds off the ball(28) standing(EC) Default for NT is "D0 F0 08 EA". This means place(D0) even with ball(F0) 1yd off the ball(08) down(EA) Easy, huh? That is basic field placement without pre-snap movement. My advice and what has been a huge help to me is to find defensive playbook you like and/or draw your defensive formation on paper and then mark off the yards of where you want the players to line up. Pre-snap Movement (EB, ED, 80-8A are the shift commands) The Shift commands must come after the X coordinate and before the stance. The Shift commands are always followed by Time in secs(in hex), x14 is 1 second. This tells the player when exactly to begin shifting. The timing of the shift is very important because it is the difference in the defense looking professional or like a fire broke out. The is snapped by COM & COA in about 6-8 secs just to give you an idea. 80 - 8A Command (only exception to the pre-snap format above) On offense, this is the Motion command. On defense is the is Follow command. The defender will follow the offensive player that you choose, everywhere that he goes. If that offensive player does not move, the defender will go line up even with him (just Y coordinate; X coordinate is not affected--- if 5yds back, will stay 5yds back). Time then Stance immediately follows this command. "8" is followed by the player chosen. Here are the players: QB=0, HB=1, FB=2, WR1=3, WR2=4,	TE=5,	C=6,	LG=7,	RG=8, LT=9,	RT=A For example, our FS, "D0 C8 50 83 28 EC" means place(D0) 5yds above ball(C8) 10yds off of the ball(50) follow WR1(83) in 2 secs(28) standing(EC). *** With this shift command, the player will start in the down position and finish in the down position regardless of what stance you choose. *** EB & ED Commands These shift commands are also followed by time and stance but differently. Unlike the 80-8A command, YOU must tell the player exactly where to go. We do that with the move commands D7, D8, & D9. You must do this after time and before the stance. Here is a couple of examples of the EB & ED commands with the FS again: "D0 C8 50 EB 3C" & "D0 C8 50 ED 3C" both mean the same thing: place(D0) 5yds above ball(C8) 10yds off the ball(50) shift(EB, ED) in secs(3C) So, what's the difference? With "EB", player starts in down position and finishes in whichever stance you choose. With "ED", player starts in standing position and finishes in whichever stance you choose. Use "ED" for LBs and DBs and use "EB" for the DL to give the best look. D8 Command (Absolute ---Exact spot on field) D8 move command along with the D7 command is what you're probably going to use most often. D8 command uses D0's Y coordinates and Scale 2 X coordinates. Let's use our same FS as an example: "D0 C8 50 ED 3C D8 C8 D8 EC" now means place(D0) 5yds above ball(C8) 10yds off of the ball(50) shift from standing(ED) in 3 secs(3C) move to exactly(D8) 5yds above ball(C8) 5yds off the ball(D8) standing(EC) Our first pre-snap movement!!! We moved our FS 5yds closer to the Line of Scrimmage, while keeping him 5yds above the ball. Now let's move him again: "D0 C8 50 ED 3C D8 F0 D8 EC" now means place(D0) 5yds above ball(C8) 10yds off of the ball(50) shift from standing(ED) in 3 secs(3C) move to exactly(D8) even with the ball(C8) 5yds off the ball(D8) standing(EC) Now we moved our FS even with the ball and 5yds closer to the Line of Scrimmage from his default position. D9 Command (Relative to middle of field) D9 uses D1's Y coordinates and Scale 2 X coordinates. Use of the D9 command will be a rarity as the D7 & D8 command can pretty much make it obsolete. I personally don't use it at all. Mainly use it for CBs. Here is our LCB as an example: "D1 C0 28 ED 3C D9 C0 F8 EC" means place(D1) at bottom sideline(C0) 5yds off of the ball(28) shift from standing(ED) in 3 secs(3C) move relative(D9) to bottom sideline(C0) 1yd off of the ball "press coverage"(F8) standing(EC) D7 Command (Relative to player's position) D7 move command offers the most options. D7 is relative to your player's position. Where your player is already located is "00" for both Y & X coordinates. D7 also uses Scales 1 & 2 as both Y & X coordinates. *** When you want to move your player down or forward, use Scale 1. When you want to move your player up or back off the ball, use Scale 2. *** *** If you are only going to adjust the Y coordinate, the X coordinate will be "00". If you are only going to adjust the X coordinate, the Y coordinate will be "00". *** Here is a few of the many possibilities: Remember our FS that we lined up even with the ball and 5yds back? "D0 C8 50 ED 3C D8 F0 D8 EC" Now we can do that same thing with the D7 command. Here goes: "D0 C8 50 ED 3C D7 28 28 EC" place(D0) 5yds above ball(C8) 10yds off the ball(50) shift from standing(ED) in 3 secs(3C) move from current position(D7) move down 5yds(28) move forward 5yds(28) standing(EC) Now let's keep him 5yds above the ball and move him back 5yds so that he will be 15yds off of the ball. Here goes: "D0 C8 50 ED 3C D7 00 D8 EC" place(D0) 5yds above ball(C8) 10yds off the ball(50) shift from standing(ED) in 3 secs(3C) move from current position(D7) don't adjust Y coordinate(00) move back 5yds(D8) standing(EC) Finally let's move him down even with the ball and keep him 10yds back. Here goes: "D0 C8 50 ED 3C D7 28 00 EC" place(D0) 5yds above ball(C8) 10yds off the ball(50) shift from standing(ED) in 3 secs(3C) move from current position(D7) move down 5yds(28) don't adjust X coordinate(00) standing(EC) Folks, that is Field Placement & Pre-snap Movement in a nutshell. On to the Post-snap Instructions. Post-snap Instructions Now that you have gotten the hang of the move commands D7, D8, & D9, it's time to use them. Immediately after choosing your stance you must put postsnap instructions because defense doesn't have formation pointers like the offense. So set your player to move where you want them to with the move commands then you can give them roles or assignments. Let's use zone defense as an example. To stop in a zone coverage, the instruction is "FF EC BD". Here goes, using the RILB, who from his default position(without pre-snap movement) will drop into a 5yd zone in the middle of the field: "D0 E0 18 EC D8 F0 D8 FF EC BD" place(D0) 2yds above ball(E0) 3yds off the ball(18) standing(EC) move to exactly(D8) even with snap of ball(F0) 5yds off the ball(D8) stop and face QB or ball "zone"(FF EC BD) & "D0 E0 18 EC D7 10 F0 FF EC BD" place(D0) 2yds above ball(E0) 3yds off the ball(18) standing(EC) move from current position(D7) move down 2yds(10) move back 2yds(F0) stop and face QB or ball "zone"(FF EC BD) will both give you that same result. Now I will give you a list of instructions(nes, snes, & genesis) you can use once you get your players where you want them. MAN TO MAN NES SNES GENESIS HB FF 04 BE FF 93 FC FF 00 03 96 9C FB FF 08 BE FF 97 FC FF 00 03 96 A4 WR1 FF 0C BE FF 9B FC FF 00 03 96 AC WR2 FF 10 BE FF 9F FC FF 00 03 96 B4 TE FF 14 BE FF A3 FC FF 00 03 96 BC OTHER ROLES NES SNES GENESIS RUSH STRAIGHT FF AD AA FF 3C E9 FF 00 03 6F EC RUSH FOLLOW FF BC AA FF 4B E9 FF 00 03 70 06 MIRROR BALL CARRIER FF C2 AA FF 51 E9 FF 00 03 70 10 ZONE COVERAGE FF EC BD FF 7B FC FF 00 03 96 6C DEEP COVERAGE FF 18 BE FF A7 FC FF 00 03 96 C4 *** When it comes to Man to Man codes, please move you defender back 3 to 7 yards back before putting in the Man to Man instructions. Because the player sits still for about 3 tecmo seconds before they move from their presnap position. So if you use right away after the stance, that player will be wide open for a good gain before the defender even makes a move. This is the reason that by default the CBs lined up 5yds off of the ball to compensate for this. *** Now it is time to place all these instructions somewhere to see your new defensive plays. The defense instructions start at xA010(NES), x165E8F w/o header(SNES) x16608F w/header(SNES), x35AA2(GENESIS). They all start with special teams. So it is safe to start overwriting the original instructions starting at xA606(NES), x16602A w/o header(SNES) x1661AC w/header(SNES), x36172(GENESIS). I personally suggest you start with the nes version first, then go to the other two. Save the GENESIS for last because putting in its instruction is nothing like the NES or the SNES. I will have section on the GENESIS all its own. I also FF out a section of the original instructions so that I can see my own clearly not to make any mistakes. When open a hex editor and go to these address given for a particular system, make note of the address you start at for each of those players' instructions. We will need to convert those addresses to pointers so the game knows where to look for instructions. A word to the wise, type in your instructions in this order, RE, NT, LE, ROLB, RILB, LILB, LOLB, RCB, LCB, FS, SS. This is to make things less confusing because when you go to type in your pointers, they will need to be in that order, otherwise a DL maybe lining up against a WR instead of the CB. Example, Nes: your first instruction goes in at xA606. Subtract x10(in hex) to get "A5F6", now swap the bytes around to get "F6A5". F6A5 is your pointer for that player's instructions. Make note of your pointers for each of the 11 players on defense for that play. Example, Snes: your first instruction goes in at x16602A w/o header(nearly all roms on the site will not have headers) Subtract x200(in hex) to get "165E2A", now drop first two digits(1 byte) to get "5E2A", now add x8000(in hex) to get "DE2A", now swap them to get "2ADE". 2ADE is your pointer for that player's instructions. Make note of your pointers for each of the 11 players on defense for that play. Example, Genesis: your first instruction goes in at x36172. Add three zeros to the beginning to get "00036172". 00036172 is your pointer. The Genesis is by far the easiest when it comes to pointers because is uses absolute addressing. Your address or offset is the pointer. You just convert it to long word by add 3 zeros to the beginnig. And that is all that is easy on the Genesis. Once you have all your pointers, it is time to type them where they go, but first, we must set our rom to have 8 set defenses(it is easier that way). I normally use play#s 04, 05, 06, 07, 08, 09, 0A, & 0B(in order: up a, left a, right a, down a, up b, left b, right b, down (remember Genesis top plays are b and bottom plays are a). Plays 00, 01, 02, & 03 are for special teams. So you need to copy and paste the following code(the spaces included) using a hex editor in the following addresses: 1DC10x (NES), x161A5F w/o header(SNES), x161C5F w/header(SNES), x3C8D0(GENESIS) Set Def Plays 04 05 06 07 08 09 0A 0B 04 05 06 07 08 09 0A 0B 04 05 06 07 08 09 0A 0B 04 05 06 07 08 09 0A 0B 04 05 06 07 08 09 0A 0B 04 05 06 07 08 09 0A 0B 04 05 06 07 08 09 0A 0B 04 05 06 07 08 09 0A 0B 04 05 06 07 08 09 0A 0B 04 05 06 07 08 09 0A 0B 04 05 06 07 08 09 0A 0B 04 05 06 07 08 09 0A 0B 04 05 06 07 08 09 0A 0B 04 05 06 07 08 09 0A 0B 04 05 06 07 08 09 0A 0B 04 05 06 07 08 09 0A 0B 04 05 06 07 08 09 0A 0B 04 05 06 07 08 09 0A 0B 04 05 06 07 08 09 0A 0B 04 05 06 07 08 09 0A 0B 04 05 06 07 08 09 0A 0B 04 05 06 07 08 09 0A 0B 04 05 06 07 08 09 0A 0B 04 05 06 07 08 09 0A 0B 04 05 06 07 08 09 0A 0B 04 05 06 07 08 09 0A 0B 04 05 06 07 08 09 0A 0B 04 05 06 07 08 09 0A 0B 04 05 06 07 08 09 0A 0B 04 05 06 07 08 09 0A 0B 04 05 06 07 08 09 0A 0B 04 05 06 07 08 09 0A 0B 04 05 06 07 08 09 0A 0B 04 05 06 07 08 09 0A 0B 04 05 06 07 08 09 0A 0B 04 05 06 07 08 09 0A 0B 04 05 06 07 08 09 0A 0B 04 05 06 07 08 09 0A 0B 04 05 06 07 08 09 0A 0B 04 05 06 07 08 09 0A 0B 04 05 06 07 08 09 0A 0B 04 05 06 07 08 09 0A 0B 04 05 06 07 08 09 0A 0B 04 05 06 07 08 09 0A 0B 04 05 06 07 08 09 0A 0B 04 05 06 07 08 09 0A 0B 04 05 06 07 08 09 0A 0B 04 05 06 07 08 09 0A 0B 04 05 06 07 08 09 0A 0B 04 05 06 07 08 09 0A 0B 04 05 06 07 08 09 0A 0B 04 05 06 07 08 09 0A 0B 04 05 06 07 08 09 0A 0B 04 05 06 07 08 09 0A 0B 04 05 06 07 08 09 0A 0B 04 05 06 07 08 09 0A 0B 04 05 06 07 08 09 0A 0B 04 05 06 07 08 09 0A 0B 04 05 06 07 08 09 0A 0B 04 05 06 07 08 09 0A 0B 04 05 06 07 08 09 0A 0B 04 05 06 07 08 09 0A 0B 04 05 06 07 08 09 0A 0B 04 05 06 07 08 09 0A 0B Now let's type our pointers for each play. Let's calculate Up + A(play 04) : NES= play # * 16(in hex) + 6010 = address where to type in pointers (RE, NT, LE, ROLB, RILB, LILB, LOLB, RCB, LCB, FS, SS) so: 04 * 16 = 58. 58 + 6010 = 6068. "6068" is the address where you type your pointers for play# 04. Repeat for each play. SNES(w/o header)= play# * 16(in hex) + 164725 = address where to type in pointers (RE, NT, LE, ROLB, RILB, LILB, LOLB, RCB, LCB, FS, SS) so: 04 * 16 = 58. 58 + 164725 = 16477D. "16477D" is the address where you type your pointers for play# 04. Repeat for each play. SNES(w/ header)= play# * 16(in hex) + 164925 = address where to type in pointers (RE, NT, LE, ROLB, RILB, LILB, LOLB, RCB, LCB, FS, SS) so: 04 * 16 = 58. 58 + 164925 = 16497D. "16497D" is the address where you type your pointers for play# 04. Repeat for each play. GENESIS= play# * 2C(in hex) + 399FC = address where to type in pointers (RE, NT, LE, ROLB, RILB, LILB, LOLB, RCB, LCB, FS, SS) so: 04 * 2C = B0. B0 + 399FC = 39AAC. "39AAC" is the address where you type your pointers for play# 04. Repeat for each play. Genesis Mini Extra Guide If you want to edit the Genesis plays, be prepared to be bold. When you make NES defenses or offenses, it is easy to convert them to SNES plays just by changing the appropriate instruction I gave in the list. The placements, shifts, move commands, x & y coordinates will be exactly the same as the NES. The same goes for the Genesis as all 3 systems use the exact same ones except for what I listed. Then, you just have to make your pointers for each system. With that said, here is the difference when it comes to the GENESIS for typing in those instructions. Remember our FS again? I will show you instructions for the SS this time instead, in all 3 systems. NES: D0 18 50 ED 3C D7 28 28 EC FF 18 BE SNES: D0 18 50 ED 3C D7 28 28 EC FF A7 FC GENESIS: 00 D0 00 18 00 50 00 ED 00 3C 00 D7 00 28 00 28 00 EC 00 FF 00 03 96 C4 The Genesis instructions must start with "00". There is also "00" between each byte of instruction you are going to type in. The exceptions to that is the instructions in the list above in the guide, the placement command D0, & move commands D7, D8. The instructions in the list above can just be typed in as is. However, when it comes to D0, D7, & D8 commands, sometimes a "FF" byte is used instead of "00". D1 & D9 commands are not affected by this and will use "00" like everything else that does. *** Here are those circumstances: If your Y coordinate or X coordinate begins with a letter like "C8", you must us "FF" in front of it instead of "00". If you don't do this, your player will now show up on the field, and the game will play with only the players you typed in correctly. *** Example using our FS: "D0 C8 50 ED 3C D7 00 D8 EC FF EC BD" would be this in Genesis: "00 D0 FF C8 00 50 00 ED 00 3C 00 D7 00 00 FF D8 00 EC 00 FF 00 03 96 6C" Closing That covers the basics of everything for each system. I will be writing an advanced guide for those who want to dig even deeper into making pro style defenses. I will be covering my defenses which are usually much more complicated than all I just explained. It will deal with randomizing if a player shifts or not for a given play or how often he does. Giving a defensive player 3 to four different roles on one particular play so the offense will never know what each player is going to do regardless of the formation the opponent sees. Randomize whether a defender will break their pass coverage responsibility to help in run support. I'll even throw in a few offensive things like, shifting a QB from under center into the shotgun. All this and more will be in my next guide. Feel free to PM me if you have any questions. 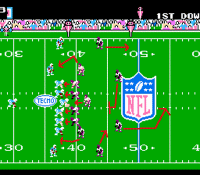 Much Thanks goes to Jstout for his guide NES Play Design Info which is here: http://tecmobowl.org...ay-design-info/ I studied that for many many hours doing a lot of testing. ROM FINALLY READY! (See bottom of this post) ======== Only 16 NFL teams. The game is still fast, tough, and fun. This is by far the best and most refined version yet. However, there might still be a few minor graphical bugs that pop up from time to time. This is a work in progress, but this version represents a good 1/2 year of tweaks from the last version. So enjoy it. There are a few new plays this year, and quite a few plays have been updated/tweaked. There is a new formation "Pistol" and it has a "option run", an "option sweep", and a pass. (not real option, but try it and see - 49ers have the Pistol default playbook, check it out.) There is a pass "diva" available in each passing slot, etc. EXPLORE the plays. Lots of ways to run a season with different playbooks, etc. Divas and any play (except normal runs and passes) where the MAN controls someone other than the primary ball carrier - the graphic looks like an "M". Here's the layout of the playbooks. This post will be updated as needed. ======== tsb 14-15 NFL STREET buck v1A.nes peace out.